Eight-year-old Daniel, who has autism, binged on sweets while his family slept. His mother, Calleen Petersen of Anchorage, routinely dragged him from church due to frequent emotional outbursts. Shopping trips were anxiety-filled, with Calleen never knowing if Daniel would have a meltdown in the cereal aisle. But since Charlie, a 3-year-old service dog trained by Arctic Paws for Service in Willow, joined the Petersen family last October, these behaviors have dramatically decreased. The family sits through entire church services uninterrupted. In public, Charlie is a calming distraction when Daniel becomes overwhelmed, minimizing his outbursts. The night binges have stopped too. Now, Daniel only leaves his room to tell his parents that Charlie, who sleeps on his bed, needs to go outside. • Diabetes/Hypoglycemia. Dogs can be trained to alert when a child’s blood sugar level is too high or too low. • Mobility issues. For children with cerebral palsy and other mobility issues, dogs can help stabilize them when standing, retrieve fallen items from the floor or other places the child cannot reach, open doors and operate light switches. • OCD. Dogs can be trained to alert parents if the child is engaging in unwanted repetitive or dangerous behaviors. • Post-Traumatic Stress Disorder. 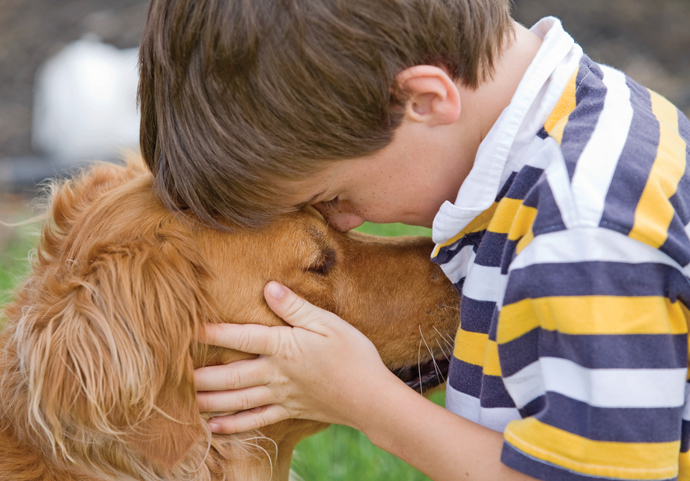 Dogs help decrease the child’s stress and anxiety levels. • Seizures. Dogs can be trained to alert to the onset of seizures and to remain with the child until the seizure ends or help arrives. About 1 percent of all babies born in Alaska each year will develop an autism spectrum disorder (ASD), according to the Centers for Disease Control. ASD, or autism, is a developmental disability that can cause social, communication and behavioral challenges. But parents are finding that service dogs can have a positive impact on their child’s life. Many children with autism become overwhelmed by too much stimulation, causing meltdowns. Service dogs act as a foundation and help decrease the child’s anxiety, which can minimize or avoid a meltdown, says Betsey Jacobs, founder of The Other Paw in Fairbanks. “Having their dog there to touch and pet and hold on to gets them through those moments when they’re overwhelmed,” she says. The dogs are trained to lie across the child’s lap or apply pressure with his paws or nose when a child’s anxiety levels rise, says April Merchant, president and founder of Midnight Sun Service Dogs in Anchorage. This not only provides comfort, but sensory input that children with autism crave. Children with autism often struggle with knowing how to approach people in social situations. The dog helps bridge that gap. It’s a phenomenon Calleen has noticed. She says Daniel’s social skills have improved immensely since getting Charlie, making people more willing to approach him. Physical safety. Many children with autism have a tendency to bolt. The dog can be tethered to the child to stop him from running, or can be trained to herd the child to keep her close by, April says. Being able to control the dog builds confidence by showing the child that she can rely on herself, April says. Calleen says she has noticed that Daniel, who slouches due to the low tone, stands taller when he’s with Charlie. Energy outlet. Children with autism often fidget with their hands or feet, Betsey says. The dog can lie on the child’s feet to provide sensory input, and the child can pet the dog to keep hands busy. Improved verbal skills. Children often talk to the dog, or talk to others through the dog, even though they previously spoke to no one, April says. Decrease parent anxiety. Parents have decreased anxiety in public, Betsey says, because the dog’s presence alerts people to the fact that a meltdown is more than a child simply acting out. It also helps parents feel slightly more in control of an out-of-control situation. “You know that you have another tool in your tool bag to help with those outbursts,” Calleen says. Guide dogs for the blind have been around since the 18th century. But training service dogs to help people with other disabilities wasn’t introduced until 1975, when Dr. Bonnie Bergin began training dogs to help people with mobility issues. Today, the philosophy has expanded to include training dogs to provide assistance for a number of disabilities. The special dogs, which come from shelters, pet rescues or breeders, are trained in about 80 to 120 commands for use in service. Proofing, where the animal practices his skills in everyday life, is the hardest and longest part of training, April says. On average it takes two years before a dog can be placed with a child. “You will see the child’s body language change, you will see this wall come down, and the dog will meld with the child,” she says. And that magic affects not only the child, but the entire family as well.